BBC’s iPlayer Sets the bar for on-demand broadcast content. No other channel comes even close to the quality of iPlayer. You can stream content over Wi-Fi and 3G and just like the desktop version, you even add shows to your Favourites so they’re ready and waiting to be watched as soon as a new episode is available. Netflix is a subscription based service. Subscribers can access a huge library of TV and stream them. While it may be one of the most difficult apps to set up, it’s well worth it. It’s a great app for every fan of the versatile VLC media player as the app gives the same power to your phone. Even better, it’s free, with a few nags/limits to encourage an upgrade to the paid version. While some will have instant success in creating a connection, others may be fiddling with router ports to great dismay. It is definitely worth the pain, trust us. An iPhone version of this app has been available for some time and now Sky had confirmed it will be made available for some Google Android devices this month. Sky Go lets Sky subscribers access live broadcasts from all five Sky Sports channels, ESPN, Sky New, Sky 1, Sky Living, Sky Atlantic, Sky Arts and 11 Sky Movies channels from their device. Google’s own movie rental service launched late last year. A catalouge of well over 1,000 films is available for rent via the Google Play Store with prices starting from as little as $4. 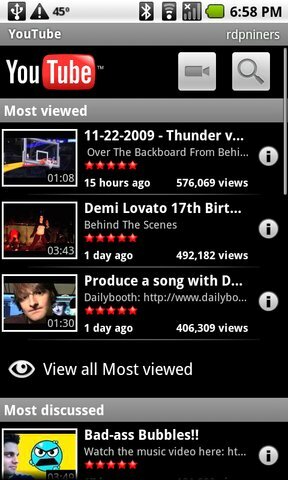 It is amazing to see how one app manages videos from the world’s most popular video service. You will get better results by letting your browser handle the links. Your videos will stream in Flash-free WebM/HTML5 format, and you’ll sometimes have your pick of higher-quality streams. Compared to the memory size, battery use, and load time of Flash, it’s a pretty nice alternative. If your YouTube links are automatically loading in the YouTube app, head to your Settings, into Applications, then click the YouTube app and press the “Clear Defaults” button. It’s also a free app in the market, download it here. Next articleLG Changes Name of "Optimus LTE" to "Optimus True HD LTE"
Thanks for updating me on so many Android Apps which can be used to watch Movies and Android TV. I have only used Sky Go apps others apps I’ll be using soon.